The Hippodrome Casino, located in the busiest street in Europe, has installed a WineEmotion Quattro+4 dispenser that offers 4 white and 4 red wines to their guests. Utilising the WineIdea software and self-serve wine card technology, a Hippodrome Wine Card can be purchased to allow guests to serve themselves from the wine dispenser in 25ml, 50ml and 70ml tastes. Supporting wine notes and the on-hand wine sommeliers will provide further information about the carefully selected wines on offer. 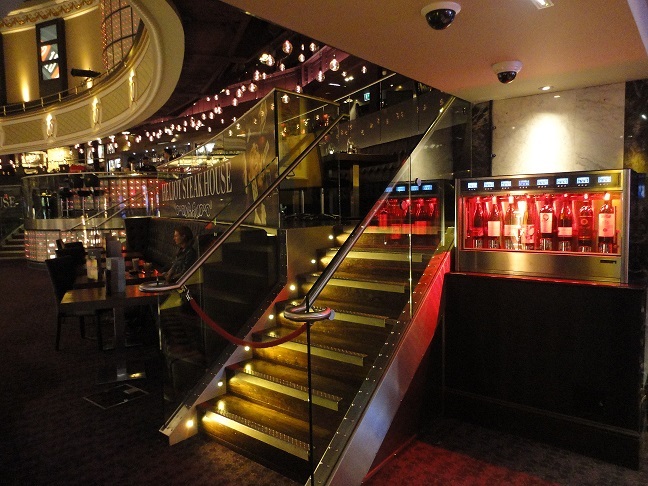 WineEmotion UK worked with the Food & Beverage Team at Hippodrome to ensure all requirements were considered prior to installation, ensuring the on the day everything ran smoothly. This was particularly important, not only because the casino is a 24-hour operation, but due to the high security requirements of the IT system. Argon gas was chosen to ensure the best possible preservation conditions for the fine wines on offer. The Hippodrome chose WineEmotion due to the ISOL+ patented technology as well as the great design of the wine dispenser range. To enhance their wine by the glass program, it was important for The Hippodrome that the wine dispenser they selected could guarantee the quality of the premium wine they wished to service from the dispenser. With WineEmotion’s guarantee of no cross contamination and the unique pneumatic bottle lifting system, there was no other alternative that could match WineEmotion’s quality and styling. Next time you are visiting and have some luck on the ground floor tables, then why not go upstairs to the Heliot Cocktail Bar and celebrate with a glass of fine wine from The Hippodrome’s wonderful WineEmotion wine dispenser!